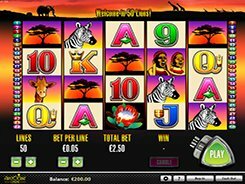 1 Can 2 Can is an Aristocrat-powered video slot with 5 reels and 25 paylines. 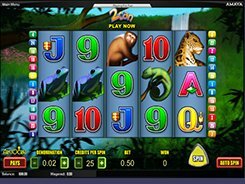 Themed around South American tropical jungles, the slot incorporates butterflies, reptiles, monkeys, and other creatures who inhabit the Amazon rain forest, as well as traditional playing card symbols. A coin value may be adjusted in a range of $0.02 to $5. Since the game has a fixed number of paylines, a bet starts at $0.5 and reaches $125 per spin. The Toucan serves as a wild; five of them gathered on a payline pay out the second largest jackpot worth 2000 coins or $10,000 on a maximum stake. 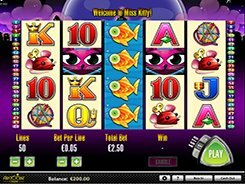 The Red Flower is a scatter, with three, four or five of them anywhere on the reels awarding free spins, the number of which depends on the number of scatters in the triggering round. There is a unique Multi-Wild feature that is activated in the free spin game. Whenever a wild Toucan appears anywhere in view during free spins, it awards an additional wild symbol which adds to your chances of hitting a highly valuable combination. The largest jackpot of $18750 is paid out for five scatter symbols landed in any position.